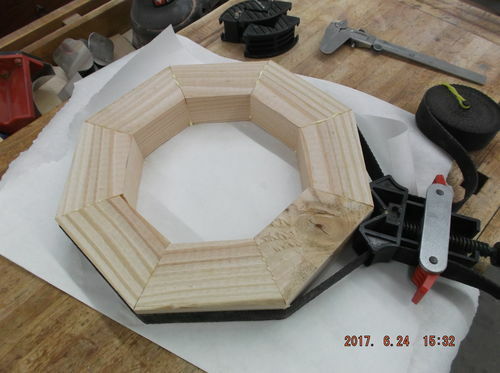 About a year ago a friend posted a picture of a spherical chess set and somewhat challenged another friend and I to attempt to build it. The friend didn’t have a lathe and we both kind of dropped the idea. I kept coming back to it and did some research and found the Instructables project. I read the article that was posted and decided it mght be something I would try. The article has a few pictures that give you an idea about how it is mounted etc. everything in the article ended with the statement I made measurements but I lost them. 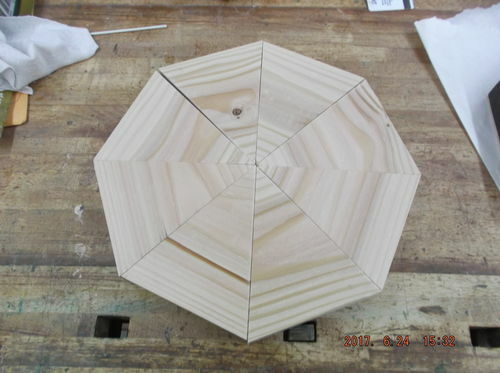 I di get from the article that he had built it with a 9” diameter and it sat on a 10” diameter base. I paid Instructables $15 for a down load of the instructions only to find they were a direct copy of what was printed on the first page. Total waste of money there. 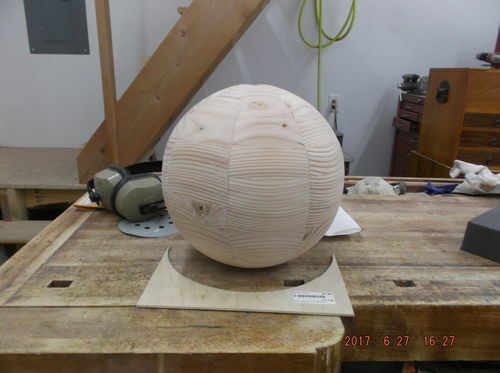 I decided I would build a 10” diameter sphere. I figured Maple and walnut would make a good contrast for the chess board. I didn’t want to waste the wood so I decided to turn the first from fir. I picked up a couple of 2×6’s from Lowe’s and went to town. 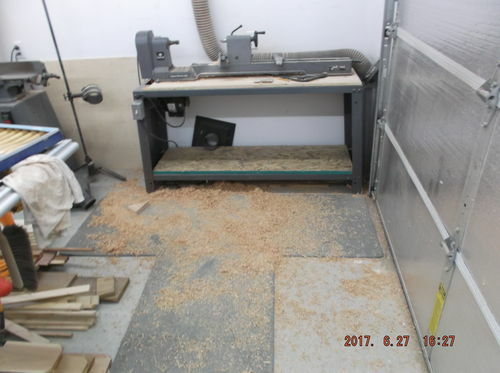 As soon as I laid out the first eight pieces I knew this would be way too heavy to turn on my lathe. I have an old 4 speed rockwell with a “12” swing. The 12” swing is possible only because of a 6”cutout in the beat just aft of the headstock. It will swing just under 11” over the bed. Hence the 10” diameter. I needed to doo something about the weight. I need to shorten these pieces. The middle 2 layers I cut down to 2.25 and for the next layers I guessed and added some to each layer to compensate for the circumference changes until the top and bottom used full size. 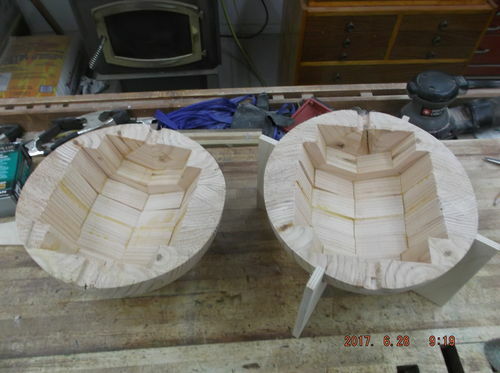 Once it was glued up I trimmed the corners off so it would turn in my lathe. 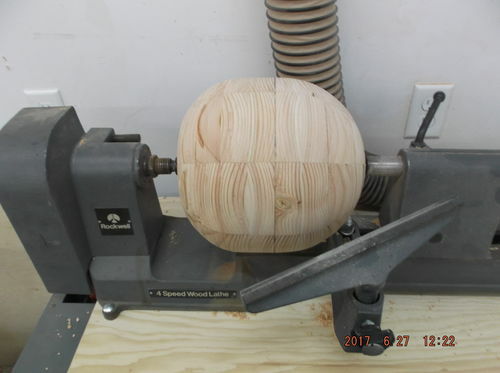 Once in the lathe time to start turning. You want something scary the weight of that block made that lathe alive. Once I got it round it settled down and I was able to get it into a spherical shape. Once I got it turned it was time to cut it in half and see how my guesses to segment lengths worked out. 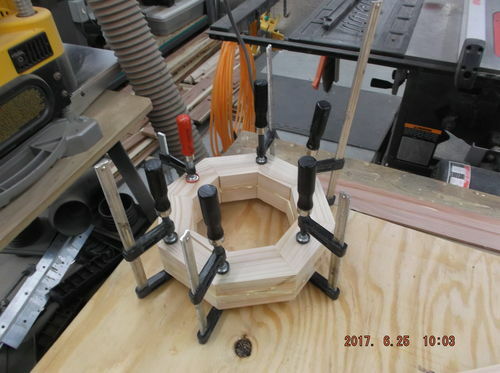 I did drill a 5/8ths’s hole top and bottom before splitting everything. Everything looks good. 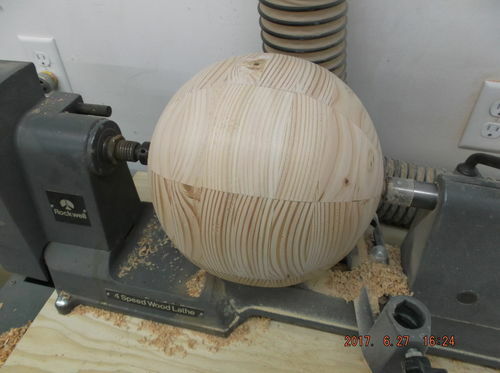 I can turn a sphere on my lathe without destroying the shop. we need to start thinking about how we are going to do this. This is where everything sat for the summer until about the end of October. Looks like a good start Bruce. Nice turning job especially considering the size of your lathe. Looking forward to seeing more of this project since I have no idea what spherical chess is. Je hebt dat goed dutchy !!! Wow Bruce. Amazingly clever sir. This looks like a daunting project Bruce. I am anxious to see the finished project.